"A great summer appetizer featuring fresh tomato salsa on toasted Italian bread." This was very easy. I added some balsalmic vinegar to bring some more flavor to it. My first attempt did end with burnt bread because I had it too close to the broiler - so be careful! A delicious recipe-tastes just like it does in Italy. Remember to move your oven rack to the furthest level away from the heat when you broil it though, or it will burn. Extremely good. Took awhile to prepare, but it was a big hit. 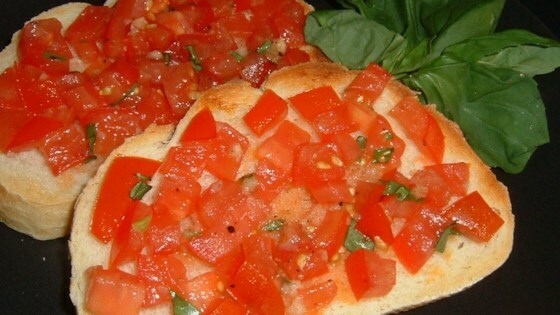 This is an excellent appetizer for an Italian or Mediterranean dish. My family loves it. It's fresh and healthy and delicious.